Manufacturer of a wide range of products which include tyvek coveralls. Tyvek Coveralls are unique protect wear as the protection is built into the fabrics itself. It acts as the best inherent barrier protection against small size hazardous particles including asbestos, lead and mold. 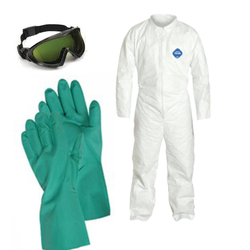 These coveralls are made from flash-spun, high-density polyethylene non woven material. These coveralls are engineered and developed with unique comfort-fit designs for greater movement and mobility during the work.